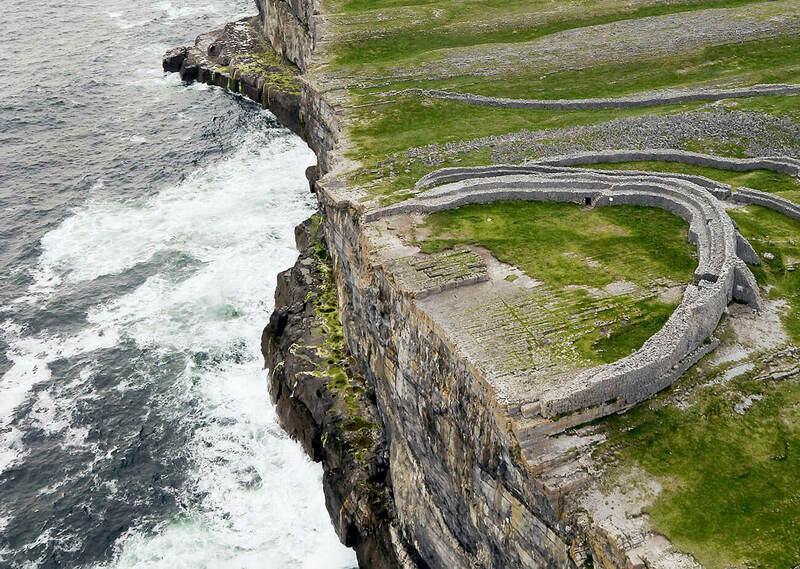 Perched on a cliff overlooking the Atlantic Ocean, Dún Aonghasa is the largest of the prehistoric stone forts of the Aran Islands. The fort consists of three massive dry-stone walls and a chevaux-de-frise, a dense band of jagged, upright stones, surrounding the fort from cliff to cliff, designed to impede attackers. Originally constructed c.1100BC, it was re-fortified around 700-800 AD. Excavations revealed significant evidence of prehistoric metalworking, as well as several burials. Visitor safety information: The fort is about 1km from the Visitors Centre and is approached over rising ground. The last section of the path is over rough, natural rock and care is needed, especially when descending. Boots or strong walking shoes are recommended. There is no fence or barrier at the edge of the cliff.